Identify and recognize the significance of art and natural light as part of the overall interior design of healthcare spaces. Assess the health and safety performance aspects of healthcare interior surfaces as they relate to durability and sustainability. Explain the importance of proper bathroom membrane preparation and installation techniques to enhance moisture control. 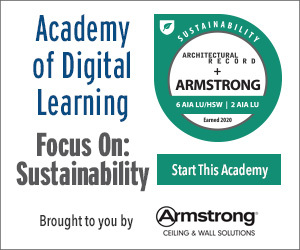 Determine ways to incorporate the principles presented into buildings as shown in case studies. Healthcare environments are intended for nurturing people and serving human needs. Too often in the past, the spaces that were built for those purposes used planning and design that focused on function and utility rather than the total interior environment. 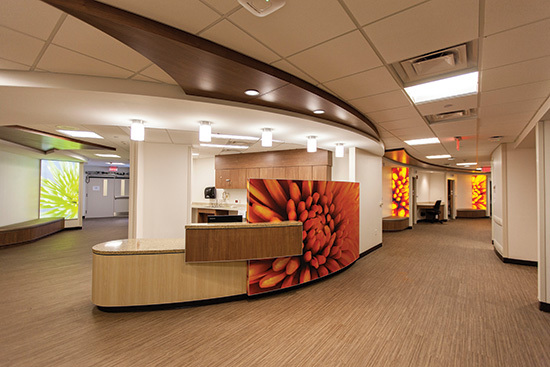 That is changing for the better and the heretofore stereotypical image of drab, institutional healthcare spaces is giving way to architects and designers who are increasingly creating beautiful, nurturing, and functional healthcare environments, even within tight timelines and budgets. Interior wall surfaces are coming to be seen as a design medium to introduce color, form, pattern, and art in the interest of humanizing the spaces. Natural daylight is being brought to more interior spaces without sacrificing privacy or durability. Patient bed areas are being treated in all respects to make them more pleasant and user-friendly. Bathroom and shower areas are treated as design components that can present themselves artfully and function optimally. Of course, all of these design elements need to meet the durability, sanitation, and cleaning requirements of healthcare facilities of all types and in fact they can. To meet these diverse goals, a full spectrum of integrated design, material, and system solutions have become available from a range of product manufacturers. Understanding and incorporating these available options can provide huge benefits that save time, money and frustration while yielding superior results in terms of creative design, humanized aesthetics, and long-term performance. The design of healthcare environments has always been influenced by many factors and has necessarily responded and evolved based on those factors. Several trends have been observed recently that are worth noting. Healthcare professionals are very familiar with the term “evidence based practice” where evidence refers to research studies and practice refers to what is done day to day. Those who keep up on the latest studies and lessons learned, can adjust their daily practices to match the proven outcomes found in the research. Design professionals can adopt this approach by being aware of relevant work that demonstrates how healthcare facility design impacts the people that use those facilities. One such area of research has repeatedly shown that integrating art, nature and beauty into hospital environments can have very beneficial results. These include a reduction in the length of patient stays by facilitating faster healing and creating a restorative space for patients, families and staff. As a result, artwork and images of nature are increasingly calzzled upon by those who recognize this in order to soften and personalize what can otherwise be seen as a sterile and/or stressful environment. Further, artwork and imagery is often incorporated as part of the building interior systems, meaning that it’s become much more than simply hanging pictures on a wall. As appropriate to each facility, this type of integrated artwork can also be incorporated into way-finding elements, used to delineate space, define task-specific communities, or identify the functionality of specific areas. The design of the immediate area around a patient bed area can have a significant impact on the healing and overall experience of that patient. 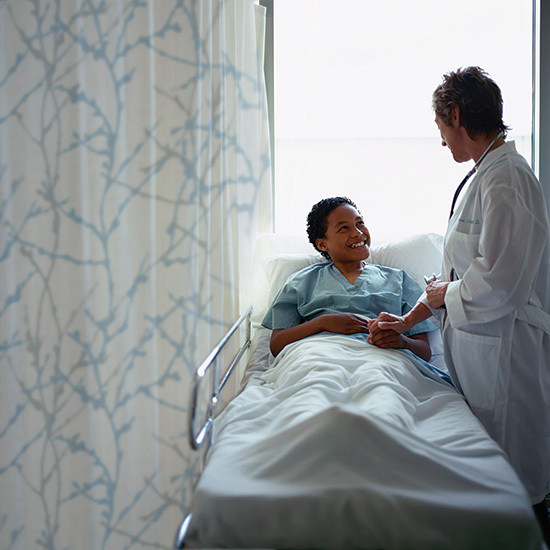 Whether in-patient or out-patient facilities are being designed, a space focused around a hospital bed and supporting items is usually needed for each person that is being cared for. All of the above observations about artwork, color, and nature apply in these typically smaller, more personal spaces too as they may have the biggest impact on the patient experience. In addition, the use of appropriately colored or patterned materials that provide a sense of warmth, comfort, and calm can have a direct impact on a patient. Further, in multi-patient rooms or areas, privacy also comes into play not only in terms of visual privacy but noise control too. By providing materials and systems that provide better noise control rest and healing can be facilitated. Bringing light into common and private areas of healthcare facilities usually means adding glass to exterior and sometimes interior walls. Fortunately, glass has many design and performance characteristics that have contributed to its use in healthcare buildings in increasing frequency. It is a durable, easy to clean material that can be configured in many different types, sizes, and shapes with varying degrees of light and vision transmittance. 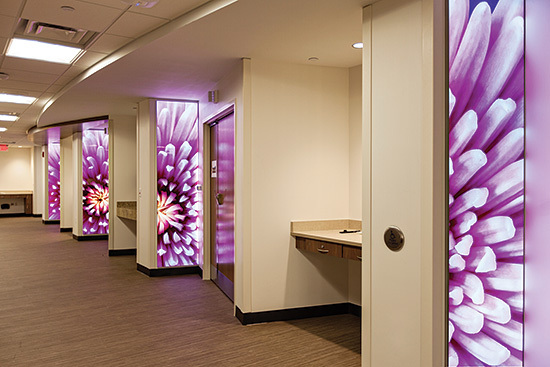 Also, with new technology, glass can be customized by adding images and color to create murals and way-finding signage allowing it to contribute to the overall artistic design of the facility. Hence, the use of light, color, and design can combine in a single wall, partition, or feature area to provide a myriad of benefits. All healthcare facilities pay particular attention to bathrooms for health, accessibility, and cleaning reasons. Increasing concern over hospital acquired infections has led to increased emphasis on eliminating bacteria from all areas of health care facilities. New methods for waterproofing shower areas help to keep them more hygienic, easier to clean and eliminate factors that support mold growth. Further, many existing facilities have a need to retrofit some of their bathrooms and shower areas to make them more accessible. Happily, new materials and installation methods provide design options that were not practical even a few years ago. These new materials and methods teamed with a systems approach to waterproofing can dramatically shorten construction time reduce total cost, and create much less need to change or remodel these areas in the future. Edge lit, LED illuminated panels incorporate artwork and the ability to add lighting in spaces as needed. Our Zoom Digital Darkroom and Zoom Image Library make it easier than ever to bring nature’s beauty to architectural glass applications. The Zoom program builds on the capabilities of our Spectra glass, offers incomparable customization potential, and provides endless ways to transform public spaces with stunning super-high-resolution photos of the natural world. With patterns inspired by nature, like Thicket (shown), the Nature’s Beauty line of Shield® fabrics captures the essence of natural environments to evoke powerful influences on well-being. These healing designs are protected by an inherent antimicrobial property that fights odor-causing bacteria and keeps the fabric cleaner longer. Healthcare facilities should be positive environments where patients can feel safe, cared for and respected. Studies have shown that daylighting improves comfort and health and that privacy is important in healthcare settings. Glass blocks let in daylight, provide visual and sound privacy and provide a secure environment. Barrier free bathrooms are ideal for healthcare facilities. With single-sloped floors to linear drains, shower curbs and doors can disappear, creating beautiful, functional and durable bathrooms that are fully accessible. Construction is simplified with the Schluter®-Shower System, including KERDI-BOARD building panels and KERDI-LINE linear floor drains.